If you want a tutorial on how to use the Turnabout stamps, check out the tips video on the Concord & 9th site or Jennifer McGuire's process video. Overall, I really loved this stamp and found it a little easier to work with than the Triangle Turnabout. I saw a sneak peak of the next one (rays) and can't wait to get that one too! 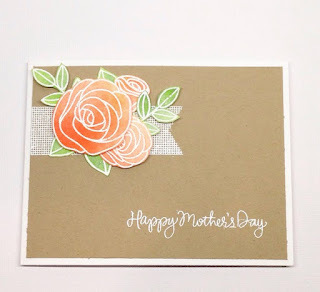 To create the card, I heat embossed a bunch of flowers on Tim Holtz' water color paper. I kept the leaves separate from the flowers to make inking easier. After embossing the images, I inked them up using distress inks. (See colors below.) I kept adding ink until I got the vibrancy that I wanted. I have to admit to not really liking the flowers until after I fussy cut them. After fussy cutting the images, I spritzed them with water to get the colors moving a bit. I used VersaMark ink and white embossing powder for the banner and sentiment. I adhered the flowers and leaves (some with foam tape). I hope you all had a happy Mother's Day! 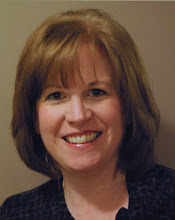 If you are hungry for eye candy, check out Yana's blog. You are in for a treat! 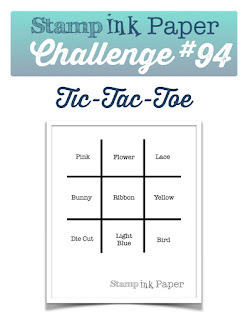 I am back with another Stamp, Ink Paper Challenge today! 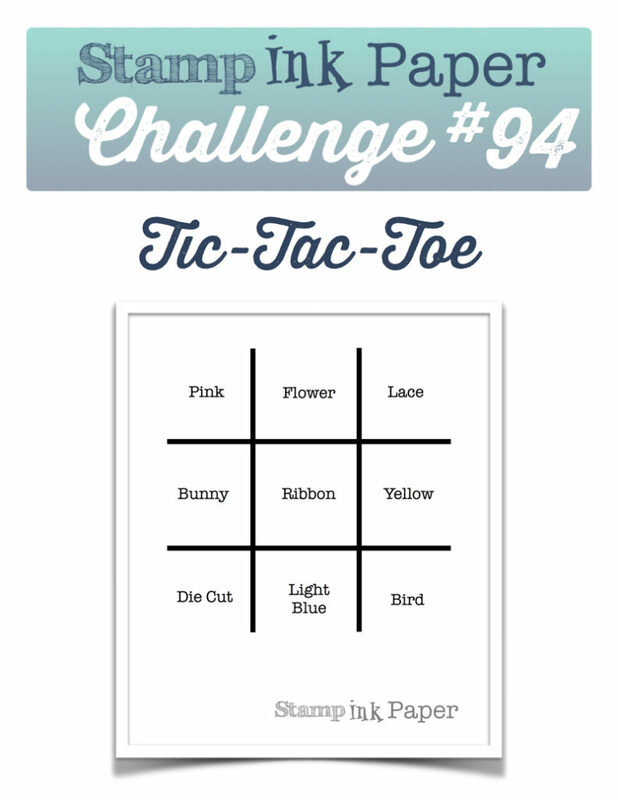 This one is a tic-tac-toe challenge. This was a pretty easy card to make. After die cutting the white mat, I stenciled the Easter egg. The bunny was stamped with Memento Tuxedo Black ink and colored with Copics. Since I didn't have a die for the bunny, I grabbed my scissors and had fun fussy cutting it! The sentiment was also stamped with Memento Tuxedo Black ink. That's all for today! I dropped into the Stamp, Ink, Paper Store yesterday and was reminded by Justin that it's been a while since I played along with one of the SIP challenges. So, here I am! 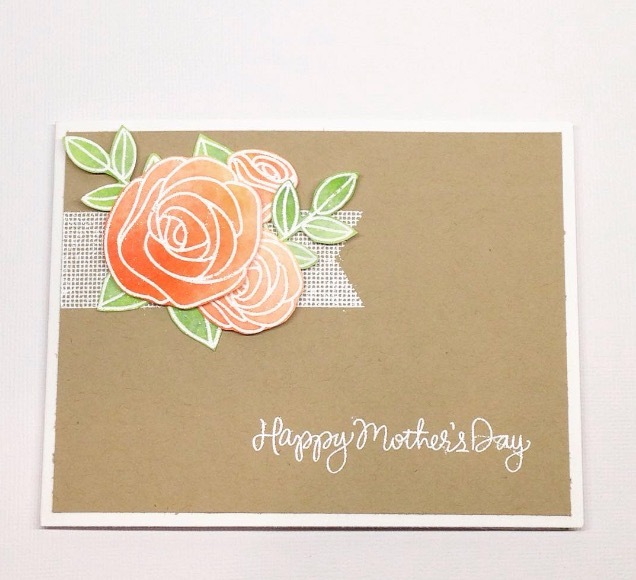 This challenge was not much of a "challenge" so to speak since I love using flowers on my cards. I did break out the new Distress Oxides to create the background. This new ink gets two thumbs up from me! Since the background was rich, I decided to keep the rest of the card clean and simple. I did die cut three flowers and layered them for added dimension. The sentiment is heat embossed for more texture. Misc. : Hero Arts white embossing powder. 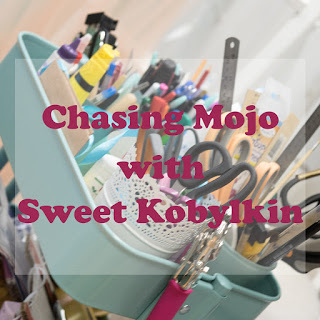 If you need help getting your mojo started this year, check out Ksenija's blog for some inspiration! Ever since the holidays, my mojo has been on vacation. I think I have lots of ideas but when I sit down to make a card the process is long, somewhat futile (with lots of attempts filling my trash can) and almost painful. Apparently, I am not alone. The other day while scrolling through Instagram (for inspiration or just to be connected to this hobby I love so much) I noticed that I am not alone. Apparently my Instagram friend, Ksenija's mojo is missing too! (I wonder if they are on vacation together in some warm and tropical destination! Lol!) Anyway, Ksenija had a great idea for a challenge to get the mojo started. You can read all about it on her blog. I also encourage you to check out her Instagram feed too since she is a very talented artist! After die cutting cream cardstock, I stamped the two leaf images using my favorite Hero Arts ombre ink. I went back and added the acorns and then a little Wink of Stella for added sparkle. The ombre ink adds a lot of depth to the stamped image with little effort. This card was easy to make--back when I had mojo! Thanks for stopping by. I hope you are inspired to join Ksenija's challenge! It's a New Year...Strike up the Band! 2016 came and went without a single blog post from me. I am all about changing that for 2017, and what better way to do so than to blog on New Year's Day! To create this card, I stamped the band members using Memento Tuxedo black and colored in the images using Copic markers. The band uniforms are in the school colors of the young man who received the card. Next, I used a MFT die to cut out the stitched circle. For the background, I stamped a random pattern using some of the elements from the stamp set. I made sure to use the trumpet since that is the instrument the birthday boy plays! The sentiment is from white embossed on a strip of black card stock. So that's all for today. Let's see if I can keep the blogging going!